Fishing Tackle for the Beginner ? It's often that I would encounter someone asking me what a beginner (fishing tackle) set up would be like. In truth there have never been a tackle set up specifically design for beginner, but if I tell the person asking that question this answer, he probably thinks that I am a snob and that's the standard answers to put off his question. So instead of thinking of what a beginners set up is like. I will usually tell a beginner to get a general kit, something that is good for fishing from a structure like a pier or jetty and perform as well from shore. My assumption is that beginners are usually younger, therefore I would stick to a more budget conscious kit that is about SGD $150. Let's start with the reel, I prefer using a spinner and therefore am more familiar with it. I would believe that a spinner would also be easier for a beginner. So let's agree on including a spinner in our "beginner's" kit. The first question an angler should ask when choosing a reel is what are the sizes of the fishes the angler likely to encounter or target? In Singapore most fishes caught are a kilo or less, maybe 5% of the time you'll hit something bigger. So let size our line to around 10 to 12lb, which should allow us to handle anything below 2.5 to 3kg or 6lb easy. We also want about 200m of line to give us some leeway to fight any bigger encounter, and also for loss of line under normal fishing circumstances. For that, I receommend our reel to be around size 2500 or 3000. Now, let's focus on the rod. If you fish from shore, you will need a longer rod if you intend to make the ability to casting "further out where it's deeper" one of your criteria. But if you fish from a structure you might want a shorter rod to tackle the fishes around its base, of course on a structure you might also want to cast out even further.... don't worry as anglers we understand :) If you're gonna be fishing on a boat without much overhead room, you might also want to think about getting something shorter. The best scenario to settle this conflict of interest would be to get two rods, but since the objective is to define "a" general kit, guess we will need to compromise. So let's pick out a 6.5 (to 7) footer, a length that is generally good for most situation. As we are going to use 10lb lines, we should pick out a Medium/Light weighted rod something that support the lower line poundage range of (6~8)lb- and higher range of(14~16)lb. For beginner and most of us, a fast action rod would be more suitable, fast action means more sensitive.... for those that haven't read this. With an initial budget of $150 and $20 taken out to pay for braided line. That will leaves us with $130, and sharing this between a rod and a reel, we've got about $65 for each. Most reels on the market have roller bearing to help it operate smoothly. And personally I feel that there are 3 places in the reel itself that would really benefit from having some form of bearing support, so we should pick a spinner with 3 roller bearings. 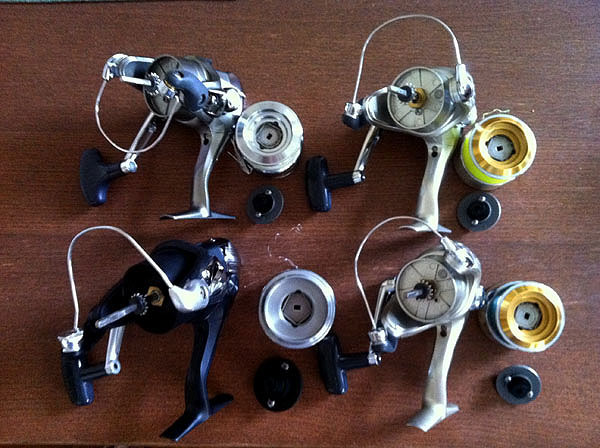 Some reels I've used and liked, and are within the budget we have are are Shimano's Sienna, Solstace and Arenos XT or Diawa's Crossfire and Regal. These are in the $50+ to $70+ range. Most of these have at least 7 or 8lb of max drag so it should be sufficient for a general kit. With a budget of $65+ for rod, I am not impressed with the range of Shimano or Diawa Rod available currently. Instead I have seen some cheap and good Lemax, Eupro, Seahawks and others. Visit more shops to compare price and look at the alternatives available, and if you have the opportunity to cross the causeway, you can get some very nice pieces at a nice price. So there you have it, a general rod for the beginner. A general kit that you can use and learn with, at the same time good enough to handle most situation at any Jetties, reservoir or pay ponds locally. 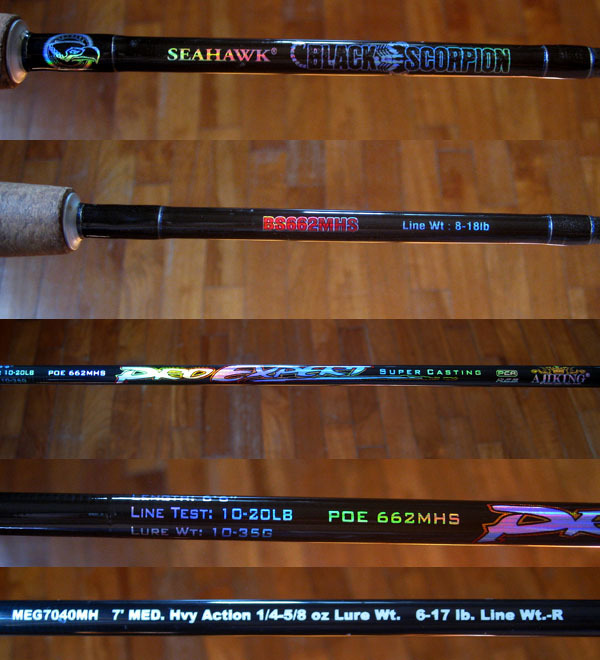 Above are some of the 6'6" and 7' rods that are suitable for general useage. Pictures of some of the reel I have mentioned.